Governors from all over the U.S. will meet Friday in Washington for winter meetings lasting four days for the National Governors Association. The meetings will last just four days but some attendees are hoping to return in 2016 to Washington four years or more. The latest meeting of the NGA will give the U.S. governors a change to show the country why executives for the states make such strong candidates for the presidency, unlike U.S. legislators, they many times must work together with lawmakers in both parties making hard choices for their constituents. However, for some potential presidential candidates from the Republican Party, such as Wisconsin’s Scott Walker or New Jersey’s Chris Christie, this meeting takes place at an awkward time when misconduct questions are plaguing their administrations. Mary Fallin, Oklahoma’s Republican governor, who is currently serving as the chair for the NGA, has set up an agenda that focuses a large part on education. The first session on Saturday focuses on aligning the education systems in the states and training programs for the workforce, with the needs of labor and business markets. The various committees in the NGA will meet also, including the homeland security committee, economic development as well as commerce, health, education, natural resources and human services. The governors on Monday will have a meeting with President Barack Obama. 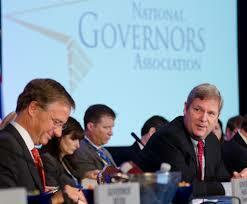 Some of the governors who are higher profile included Christie, Walker and John Kasich. Christie’s cooperation with the President at one time was his biggest liability. However, for the past two months he has been fending off questions and accusations over lane closures last year on the George Washington Bridge. While there is evidence suggesting the staff of the governor might have known and caused the lane closures, the governor has adamantly denied knowledge of the wrongdoing. Walker, the governor of Wisconsin, has been under a barrage of scrutiny due to an investigation of his staff that was in his office while he was an executive with the county. The investigation has been closed, but records regarding it were released recently giving ammunition to the Democrats. Kasich is Ohio’s governor. The Republican is another state leader considered a possible contender for 2016. He is currently ahead in a race for re-election in Ohio, but a nation poll shows he might not have much national success.